Rooms are available to rent in a spacious, 110 m², 6-bedroom apartment situated in Eixample, Valencia. The apartment is decorated in a deluxe style, with high ceilings and modern furniture. There is a large, fully equipped kitchen that has classy marble worktop surfaces and ample storage space. 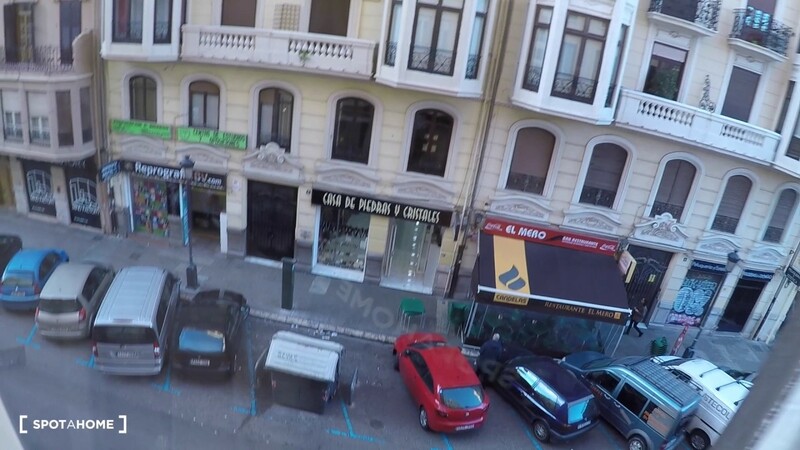 This property is located on Carrer de Castelló in the central Eixample neighbourhood. The local area is characterised by pretty streets which are home to bars, restaurants, shops and cafés for all your needs. You will also be living just 1 minute from the Plaza de Toros, and the Estació del Nord station is just 2 minutes away. You can walk into the charming old town in under 10 minutes. This apartment is stylishly decorated with sleek furniture and rich colours. The high ceilings and large rooms give the property a spacious feel. You will be living 10 minutes from the central old town. This property is very well connected by public transport, Estació del Nord is 2 minutes away, and Xàtiva metro station can be reached in 3 minutes. This apartment does not have a living room, but some of the bedrooms are very spacious. Xàtiva metro station is 3 minutes away. This apartment is just next to Valencia's Estació del Nord.